As far as I know, I’m not of East Indian descent, so I can’t help but wonder if maybe I was from India in a past life. I love the beautiful patterns in the fabric, the interesting architecture, the music, the spirituality and I really love the flavorful food and Indian spices. I’ve been cooking and playing in the kitchen with Indian flavors for a few years and wanted to include an Indian inspiration in my soup series. 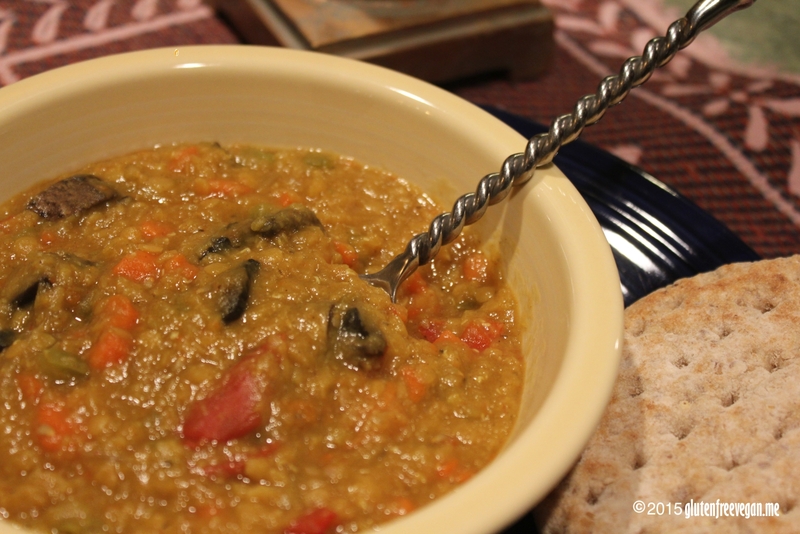 I used red lentils because they cook quickly and they’re very light. You could also use green or brown lentils. They will take a bit longer to cook and will have a thicker, heavier consistency, but they’d also work just fine in this recipe. Namaste! In large pan, add water, lentils carrots, green pepper and onions. Bring to a boil for about 3 minutes and scoop off foam from the top and discard. Cover and simmer for about 15 minutes, until lentils and veggies are soft. It’s ok to stir occasionally will simmering to check on the consistency. Once softened, stir and mash lightly with a potato masher while adding mushrooms, tomatoes and all spices. Continue stirring and lightly mashing until all ingredients are mixed well, leaving a few chunks of veggies. Cover and simmer on low heat, stirring occasionally for another 15 minutes or longer. Serve with your favorite gluten-free bread for a hearty meal or starter. This entry was posted in Recipes, soups and tagged carrots, East Indian, gluten-free, glutenfreevegan.me, glutenfreeveganme.com, healthy, indian, mushroom, red lentil, soup, turmeric, vegan, vegan cooking, vegan recipes. Bookmark the permalink.